Margarita Simonyan: Mr. Putin, thanks again for visiting us. Vladimir Putin: Thanks for inviting me. When we designed this project back in 2005 we intended introducing another strong player on the world’s scene, a player that wouldn’t just provide an unbiased coverage of the events in Russia but also try, let me stress, I mean – try to break the Anglo-Saxon monopoly on the global information streams. And it seems to me that you’re succeeding in this job. I’d like to emphasize something of the key importance. We never expected this to be a news agency or a channel which would defend the position of the Russian political line. We wanted to bring an absolutely independent news channel to the news arena. Vladimir Putin: He told us nothing we didn’t know before. I think everybody has long been aware that signals intelligence is about surveillance of individuals and organizations. It is becoming a global phenomenon in the context of combatting international terrorism, and such methods are generally practicable. The question is how well those security agencies are controlled by the public. I can tell you that, at least in Russia, you cannot just go and tap into someone’s phone conversation without a warrant issued by court. That’s more or less the way a civilized society should go about fighting terrorism with modern-day technology. As long as it is exercised within the boundaries of the law that regulates intelligence activities, it’s alright. But if it’s unlawful, then it’s bad. Margarita Simonyan: As you probably know, it isn’t Snowden, or Syria, or Turkey that’s been top news in Russia this week. It’s your divorce everybody has been talking about. Both yourself and Ms. Lyudmila Putina explained it at length when you spoke to the press after a ballet performance, but a few questions still remain. I wonder about the religious aspects of your divorce, and this is something many people are questioning at the moment. Vladimir Putin: First of all, I can tell you that Lyudmila and myself agree that it’s much more appropriate to be outspoken about our actual state of relations rather than try to keep it secret. Margarita Simonyan: Thank you. The next question will be from Maria Finoshina, who’s sitting right next to you. She is a war correspondent on RT English. She has spent 56 days in a row in war-time Syria recently, isn’t that right? I was introduced as a war correspondent. Some people believe that all correspondents are, in a way, invisible soldiers, so to say. Over the last two years we had to work in warzones, where the war was very real. I’ve spent a lot of time in Syria – 54 days just recently – we travelled across the country, visited practically every town and village. We also went to neighbouring countries, which in majority of cases did not support al-Assad’s regime. The thing that struck me most was that over time more and more people were becoming involved in the conflict. We’ve talked to a huge number of completely different people. Now, two years later, there is no single person standing on the sidelines. One way or another, the conflict affected everyone. The people we talked to were very different, I mean, we talked to, for example, widows of military officers of the Syrian Army and their children, who would maybe prefer not to be involved, but it’s impossible. Their fathers have been killed, and they must seek revenge. Perhaps they don’t want to, but they must – it’s a matter of honour. We also talked to rebels, both Syrian and non-Syrian, who were living in Syria and other places, for example, in Europe, Turkey, and Jordan. They were in very high spirits at first, very optimistic, but then they started complaining that the West had forgotten and betrayed them. They wanted more money and more weapons. As you’ve highlighted yourself, Bashar al-Assad is no angel, and we met with people who openly hated him. I remember seeing this old man in a hotel in Damascus where the UN observers were staying. He was a shoe polisher, and he kept doing his job, mechanically going through the familiar motions, and the only thing he was thinking about is when the happy news that Bashar al-Assad is gone – either dead or no longer president – would reach it. He has been hating al-Assad vigorously ever since 1982, for what his father did to the city of Hama. In Lebanon we managed to contact arms dealers who ship weaponry into Syria. They told us that they didn’t care in the slightest who got those guns and who got killed as a result. They said, “We are businessmen, we care only about money”. We talked to young boys, about 11-12 years old, who were given these guns – maybe they even came from Lebanon – put in front of cameras in their scarves and made to read aloud the words that someone else wrote. Nasty business. Well, you know, children are being used in this conflict. We have seen so much, and during our time there we became part of it. The horrifying part is that it doesn’t matter where any of these people were in March 2011, when it all began. Now it feels like they’ve crossed a critical line of sorts, losing hope and faith – in themselves and other people, perhaps even humankind as a whole, in kindness and justice. And they’ve become angry, really angry at everyone. So, coming to my question – there are people who are really angry at Russia. Some people feel that way because they think Russia is doing nothing in order to stop the bloodshed. Others are angry at Russia for supporting al-Assad and supplying weapons. And everyone’s expecting something from Russia, hoping for something. And it’s not limited to the Syrian conflict, it happens every time – in Serbia, in Kosovo; everyone’s asking where Russia is. The same is true for Iran, where we’ve been just recently, and even in Mali they ask about Russia. So, as the president of this country, I would like to ask you a question on behalf of these people. Maria Finoshina: No, no (laughter). I meant to say I wanted to ask you, as the president. Vladimir Putin: That was such a long question, so I’ll try to be concise. First of all, you mentioned I once said that Bashar al-Assad was no angel. I said no such thing, as I try to be very careful about the way I put things. What I did say, however, is that the country was obviously ripe for some kind of change, drastic change. The country’s leadership should have realised this and started implementing the necessary reforms. It’s obvious that had they done that, what we see now in Syria wouldn’t have happened. That was my first point. Secondly, I said that we’re not advocates of the current Syrian government or the country’s current president, Bashar al-Assad. And one more thing – what we wouldn’t want to do is get involved in the conflict among various denominations of Islam, between Sunni and Shia. This is their internal issue. We have very good relations with the Arab world, and we have good relations with Iran and other countries. There’s a question our Western counterparts fail to answer. One of the main armed opposition groups – specialists in Arab countries will correct me if I’m wrong – is called the Al-Nusra Front. The US State Department dubbed it a terrorist organization connected with Al-Qaeda. The Al-Nusra itself doesn’t make a secret out of it. So these are the people what will make up Syria’s future government? Our Western counterparts say that it will not happen. “How will you get rid of them, then? Chase them away like flies?” I ask. “No,” they say. So what is going to happen? They say they don’t know. This is no joke, though, this is very serious. I’ll give you another example. On the one hand, some Western countries support some organizations that are at war with Bashar al-Assad’s regime in Syria, but these same Western countries fight these same organisations in Mali. They’re not even the same organisations – they are the same people. Some have left Syria and come to Mali. The West is fighting them in Mali, but once they cross the border into Syria, they get support from the West. What is the logic in all of this? Where will it take us? You need to understand, this is not just rhetoric. Irina Galushko: My question will not be dealing with Fukushima. Recently we have spent a lot of time in Europe, covering all kinds of demonstrations. There are a lot of protests in Europe, and we can say that there are mostly young people on the streets. They take part in demonstrations because they have nothing to do – the have got an education or they are still students, but they can’t find a job. They don’t have any prospects for the future at all, let alone a promising one. So of course they are dissatisfied – they take to the streets and voice their protest against what is going on in their countries. Meanwhile the governments of those European states believe that the only solution is austerity measures – they tighten the screws, especially in terms of the social obligations. They tell those young people to wait for some ten or fifteen years, promising that maybe after that period the situation will probably get better. Do you think this the right approach? If no – then, does Russia have a recipe how to deal with this? The average national debt across Europe is about 90 per cent, and the USA is well over 100 per cent. They have a high unemployment rate. All of the budgets are deficit-ridden. So not only do they have a huge national debt, but also a massive budget deficit. Russia’s external debt is 2.5 per cent, our overall debt is 10 per cent. Russia is deficit free, our unemployment rate is 5.6 per cent, whereas in some European countries it reaches 25-26 per cent, and among young people it is up to 40 or sometimes even 60 per cent. It is a disaster. So we are in different situations. Obviously, Russia can use the so-called oil-money and rely on oil and gas exports. But I’d like to note that we don’t use monetary mission – we don’t print more money in reserve currencies the way they do in the Western countries. So it’s not just about Russia having oil and gas reserves, but it’s rather about Russia restricting its spending. The Central Bank of Russia is often criticized for high interest rates – I guess it is about 8 or 8.5 per cent at the moment, or maybe 8.25 per cent. It doesn’t matter – it is still high, while in the USA, for instance, it is 0.25 per cent, if I’m not mistaken. Europe has similar rates, too. Some say Russia should have the same numbers as well, but the Central Bank is keeping its rates this high in order to avoid financial bubbles. Of course, we could provide cheap loans, low-interest credits, which would be used by manufacturers to produce some goods that would not be much in demand later on. So you have a bubble that is about to erupt. The highest performance is finding balance between having a more liberal monetary policy and toughening spending cuts, in a way that would ensure maximum growth. I don’t think we are there yet. I believe we are not that efficient in everything we do as a government. I do hope that following our repeated meetings Russian government will make an effort and come up with some additional proposals to stimulate the economic growth and business activity in Russia. Speaking of which, one of such measures is something we use constantly, for which we get criticized by our counterparts – liberal economists: that is active support of growth in real income of the population. Last year it was about 4.5-4.6 per cent, and beginning February through April this year it has gone up to over 5 per cent. That is the growth of actual income of the population, which implies an increase in domestic demand. So the conditions we find ourselves in are different. Generally, I do share the viewpoint of some of our European colleagues who suggest we should consolidate budgets and bring discipline to the economy to get out of the crisis. Still, everything has its boundaries, and we can’t shift the entire burden to the shoulders of the population. Daniel Bushell: Mr. Putin, I’d like to hear your opinion on multiculturalism. Not long ago, the leaders of the European Union admitted reluctantly that their experiment with multiculturalism failed. When I lived and studied in England, and then worked in France and Belgium as an RT reporter it was evident that the local residents and immigrants had little in common. Over the last years Russia’s been facing the same issue of mass immigration. I’d like to ask, how can Russia avoid the same mistakes that the EU has made in the issue of immigration? Vladimir Putin: Exactly. So there was an old lady who’s lived there for 15 years, and didn’t speak English. She was telling her guests that tomorrow she would go shopping in New York. She didn’t even realize she was living in New York. So it is a general problem which is related primarily to the economy and to the need to attract a cheap labour force. Actually the same thing is happening in Russia. But in our country, despite how acute this problem is, it’s still not as severe and dangerous as it is in Europe and in the States. Why? And of course we need to educate our citizens or those aspiring to become Russian citizens in a sense of responsibility. We have to help them realize that they are in a different country now and so they have to observe our traditions and our laws; they have to respect our culture and our history. This is an entire separate field of work. It used to be ignored in the past but now we need to pay attention to this matter, and we need to contribute more centralized efforts to it. As for the domestic migration, it also is a complicated issue. Back in the Soviet Union, there used to be a domicile registration (propiska). Those who violated it were thrown in jail or banished beyond 101 km from large urban centers. This situation is much more complicated now. The Russian Constitution delegitimizes propiska, so we need more modern mechanisms to regulate this matter. But let me repeat that we do have an advantage in our country that we are a multiethnic people, and we are an integrated civilization as a whole. Margarita Simonyan: Speaking of immigrants… We have an immigrant in our midst – Jelena Milincic. She works on RT Spanish, but she is actually from Serbia. 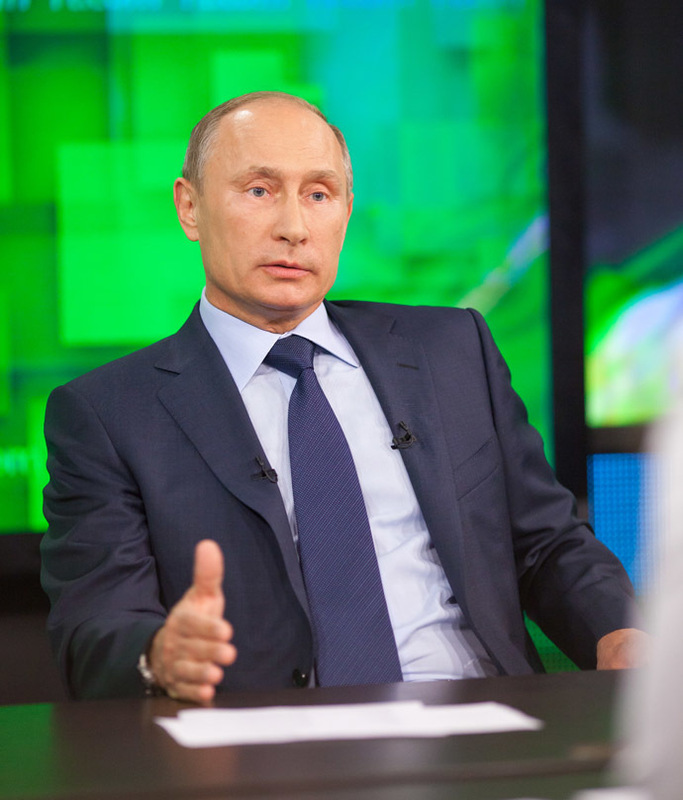 Vladimir Putin: We have to be very careful here, making sure we protect the interests of the majority. Our country is Russia, and 85% of our citizens consider themselves Russians. Other people groups living on our territories are closer to us than those living outside Russia. These are our indigenous people. And there are over 120 ethnicities indigenous to Russia. You’ve lived here for 11 years? But it takes 5-6 years to get citizenship you said. You should’ve filed already. We have to welcome professionals like you. You are a young and beautiful woman. I am sorry, but it is true that you are a woman of childbearing age. Your boss here sets a good example, by the way… Some countries, Canada, for example, have special programs to attract certain categories of people from other countries. Unfortunately, our system is very outdated in this respect. There have been some developments in this area. There are initiatives to make the citizenship procedure easier for certain categories of people from the former Soviet Union. But as a whole, our immigration policy lacks flexibility. It has to protect interests of Russian citizens, but it also needs to allow for an inflow of specialists that our country needs. So you are absolutely right, and like I said, the government is working on that. Sophie Shevardnadze: I have lived here for 8 years. Mr. Putin, I work in Moscow, but I was born in Tbilisi and grew up in Georgia. I wouldn’t be honest if I said that I wasn’t concerned about the relations between Russia and Georgia. This is something that I care about on a deep personal level. 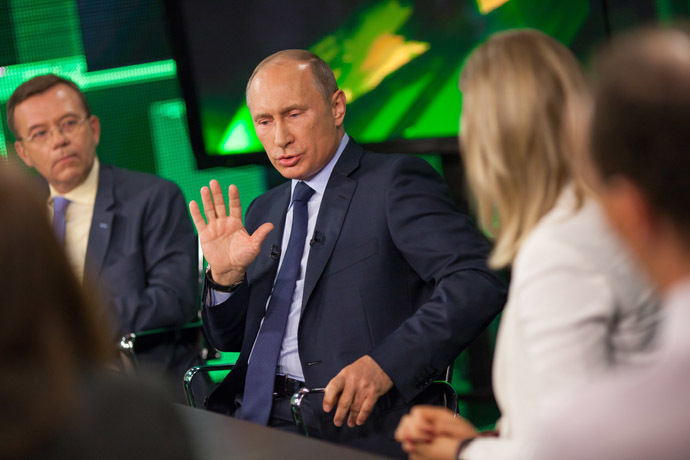 Vladimir Putin: I have talked about this on many occasions, voicing Russia’s opinion. I think that President Saakashvili made a big mistake. We have discussed it with him several times, so I don’t think he would deny this. I used to tell him, “Mr. Saakashvilli, whatever you do, please make sure there is no bloodshed.” To which he would always respond, “Of course not! We will be patient and try to work things out with Abkhazia and South Ossetia.” Unfortunately, it all ended up in a war. They had to have patience and political wisdom if they wanted to build relations with South Ossetia and Abkhazia as part of one state. Unfortunately, they failed. Russia reacted to what was going on at the time, and eventually this response led us to recognizing independence of South Ossetia and Abkhazia. I can’t imagine how this could be reversed, it’s simply impossible. Vladimir Putin: Of course, we are ready to work with Georgia. We want to restore relations with Georgia, we like Georgia. We have close ties with Georgians. You live here, you have Russian citizenship. And how many Georgians live in Russia? We are proud of their contribution, we see them as our own people. What needs to happen, so that my relatives, my close ones can freely visit me in Moscow, just like my Russian friends go to Georgia without any visas? When 6-7 years ago we had to attack Georgian territories, those were not just strikes on Georgia, we targeted militant groups that came very close to Sochi – they were only 30 km away. Do you realize how serious the situation was? Vladimir Putin: No, the Kodori Gorge was a different situation. In any case, Georgian police vehicles were transporting the militants to the Russian border. So we had to take some pre-emptive measures. And I informed the president about this. We don’t want to see this ever happen again. We want to work with Georgia, want to restore relations. Again, if we begin to work with law enforcement and security agencies, this would be the first step towards cancelling visas. Margarita Simonyan: Thank you. Salam Adil is Deputy Editor-in-Chief with RT Arabic. Salam, you have the microphone. Vladimir Putin: Gunpowder was originally invented in China, and no one has managed to keep it from spreading ever since. Then came nuclear arms, and they also started to spread. Modern means of warfare keep evolving, and they always will. I doubt if it’s possible to simply ban it all. But you certainly can – and should – introduce certain rules and exercise control. I’m sure the United States does not target civilians on purpose. And the drone operators you’ve mentioned are people, too, and I think they understand all those things. But you still need to combat terrorism. I know they are currently debating this issue in the United States, and a notion is being advocated increasingly often within the UN framework that you need to put drones under control, you need to lay out certain rules of engagement in order to prevent or minimize collateral casualties. It is extremely important. I don’t know whether our [Western] counterparts will choose this option, but I would suggest it would be in their best interest. However, there are other threats, too. For example, they are presently debating the option of using non-nuclear ballistic missiles in the United States. Can you imagine how potentially dangerous that is? What if such a missile were to launch from somewhere in the middle of an ocean, and get spotted by a nuclear power’s early warning system? How should that nuclear power react to a missile coming its way? How are they supposed to know whether that missile comes with a nuclear warhead or not? What if the missile impacts right next to its border, or inside its territory? Do you realize how perilous that can be? Or take the notion of low-yield nuclear weapons – do you realize how badly it can blur the very notion of using nuclear arms, or how low it might bring down the threshold for authorizing such a strike? Can you imagine the possible implications? Where are the limits for lowering that threshold, and who is setting them? There are many threats in the world of today, and there is only one way to address them efficiently: that is, working together within the boundaries of international law. 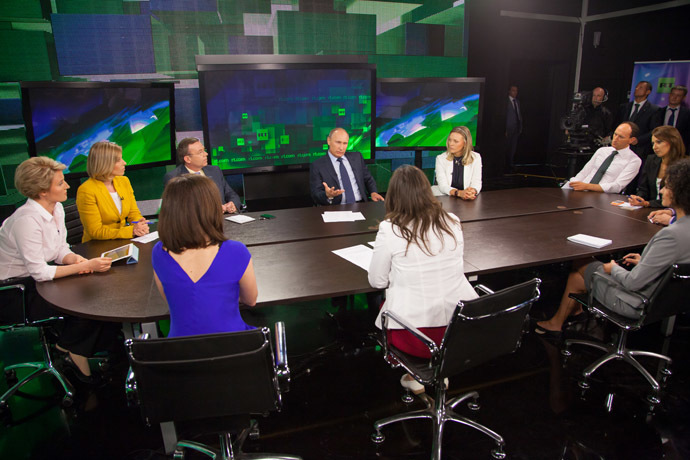 Margarita Simonyan: And now I would like to give the floor to Peter Lavelle, who is the presenter of one of our most popular shows CrossTalk. Peter has worked with RT since its very beginning. He will be speaking in English and I will translate the question for you. Occupy Wall Street, and your diplomatic mission works together and directly supports Russian opposition. I think this is wrong because diplomatic missions must forge ties between states and not meddle with their domestic politics. Getting back to popular movements. Reckless behavior is not appreciated by people. If these activists are breaking the law, then it’s illegal. If they express their will by legal means, without breaking the law then they are fully entitled to do that. Then it would be beneficial to any state because it’s a way to provide grassroots feedback on state policies – social, domestic or foreign ones. As for Mr Kudrin, he is my long-standing associate. We see eye-to-eye on many vital issues of Russia’s development. But that’s for an obvious reason – we’ve known each other for a long time now. We worked together back in St. Petersburg, and then he became a member of the cabinet and proved to be one of the most efficient ministers. I have always backed him on key decisions. If I didn’t he wouldn’t have been able to work, to implement those ideas and principles that he promoted. So to a certain extent that was our joint policy. He has his own view on certain things. It so happened that they had a disagreement with Mr Medvedev on a number of issues and since Mr Medvedev was president, he had the right to take the decision that he eventually took. Today Alexey Kudrin says that he is ready to re-join the executive branch if the authorities were more decisive. But he is quite reluctant to specify what he means by being more decisive when I ask him to. Why? Because ‘more decisive’ means ‘taking tougher steps’, for example, in terms of the pension reform, in terms of raising the retirement age. No-one, including the opposition, wants to speak about to the public. They think it’s the right way but they don’t want to talk loudly about the issue. Oksana Boyko: My question is a follow-up to your previous reply, concerning principles and a principled position. I would like, however, to apply these notions to the Iranian issue. Iran will be holding a presidential election soon. I know that Russia doesn’t like to meddle with domestic politics of other countries that’s why my question would be as general as possible. It’s more of a philosophical kind. To me, Iran is a great example of how you can create extreme tension in mutual relations by blowing out of proportion some insignificant differences. The Iranian nuclear issue that everyone’s been talking about for the last decade basically relies only on some vague suspicions which, year after year, have been dismissed even by Americans themselves. But that rhetoric has ignored the fact that Iran has been compliant with the nonproliferation regime by 99 or even 100 percent. The mainstream focus is on suspicions, but at the core, as I see it, is the relationship between the US and Iran. Tehran is partially to blame for the tension buildup, but the root of the problem is the stance of Washington, their signature foreign policy principle – friend and foe divide, meaning that if you are not their ally, you are their enemy. And it seems that the level of tolerance to dissent is quite low, and when it drops too much, we see threats of war based on groundless suspicions, as is the case with Iran, or assistance to war, as is the case with Syria. 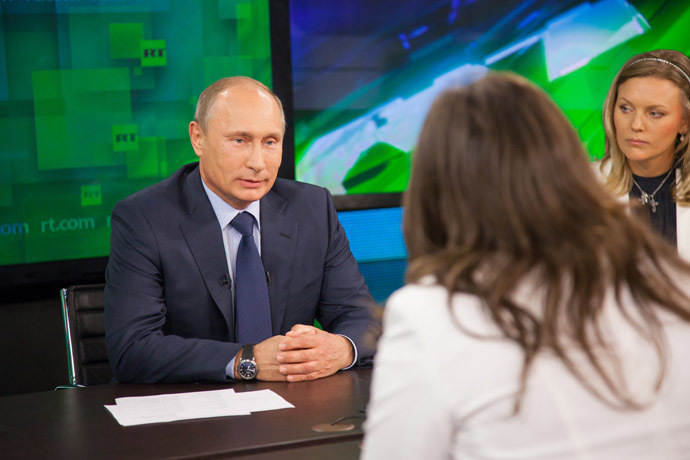 Vladimir Putin: A response to your question could take hours. It’s so complex. I will try to be as concise as possible. First, I have repeatedly voiced Russia’s official stance – Iran has the right for a peaceful nuclear program and it cannot be singled out for discrimination. Second, we need to be aware that Iran is located in a very challenging region. I have told our Iranian partners about that. That’s why Iranian threats made towards neigbouring countries, in particular Israel, threats that Israel can be destroyed, are absolutely unacceptable. This is counterproductive. Vladimir Putin: They are extremely crafty in this, and they do it to tackle their domestic political issues. When there is an external enemy, it united the nation. But I guess the United States have been employing the same technique. After the collapse of the Soviet Union, there have been no external threats that would allow Washington to dominate in the West. There must be a threat so that the US can protect their allies from it. This position yields political and economic benefits. If everyone relies on one country for protection, then this country is entitled to some preferences. So it’s very important to possess this status of a global defender to be able to resolve issues even beyond the realm of foreign policy and security issues. I think the US has been using Iran for this very purpose, that is to unite their allies in the face of a real or fake threat. Vladimir Putin: I thought you wouldn’t notice my deviation. But you did. Indeed, you are very persistent. To date, we don’t have any significant ideological differences. But we do have fundamental cultural differences. Individualism lies at the core of the American identity while Russia has been a country of collectivism. One student of Pushkin legacy has formulated this difference very aptly. Take Scarlett O’Hara from ‘Gone with the Wind’ for instance. She says ‘I’ll never be hungry again’. This is the most important thing for her. Russians have different, far loftier ambitions, more of a spiritual kind, it’s more about your relationship with God. We have different visions of life. That’s why it is very difficult to understand each other but it is still possible. So there are big differences between us. But it’s quite natural that people with such differences are determined to finding ways to understand each other better. I don’t think there is an alternative. Moreover, it’s not by chance that Russia and the US forged an alliance in the most critical moments of modern history – that was the case in WW1 and WW2. Even if there was fierce confrontation, our countries united in the face of a common threat, which means there is something that unites us. There must be some fundamental interests that bring us together. That’s something we need to focus on first. We need to be aware of our differences but focus on a positive agenda that can improve our cooperation. Oksana Boyko: I see you guys just won’t get off their backs, will you? Vladimir Putin: Any state pursues its national interests, and the US is no exception. What’s unique here is that the collapse of the Soviet Union left America as the world’s single leader. But there was a catch associated with it in that it began to view itself as an empire. But an empire is not only about foreign policy, it’s also about domestic policies. An empire cannot afford to display weakness, and any attempt to strike an agreement on equitable terms is often seen domestically as weakness. But the leadership cannot afford to display weakness due to domestic policy considerations. I think that the current administration realizes that it cannot solve the world’s major issues on its own. But first, they still want to do it, and second, they can only take steps that are fit for an empire. Domestic policy considerations play a huge role. Otherwise you would be accused of weakness. In order to act otherwise you either have to win overwhelming support or there must be a chance in mentality, when people will understand that it’s much more beneficial to look for compromises that to impose your will on everyone. But it certainly takes time to change those patterns of thinking in any country, in this case it’s the US. First and foremost, this change should take place in the minds of the ruling elite in the broad sense of this phrase. I don’t think that it’s impossible. I this we’ve almost come to that point. I very much hope we will reach it soon. Margarita Simonyan: Thank you very much, Mr. Putin. The issues we have just discussed are the headlines on our air. It is not a classic interview – we wanted to talk to you on those problems that we talk about daily to our audience. Those are very much different from what you can hear in the Russian media – since they have a different audience – and from the interpretation of the Western media as well. We are different – we have different values and views on both Russia’s domestic issues and the world’s system on the whole. But I think it would be right to say that we share one view: there shouldn’t be one leader in the world that is running the show, and it applies to the media, too. And when all the TV channels say with one accord that the main headline of the day is that a NATO drone is shot down in Libya – there should be some other channel that will tell the world about a NATO shell that on the same day killed a family of 13 people there. We actually had such a story, when our coverage was completely different from the coverage of our colleagues. We do that and we are happy to have this opportunity, as that is what we believe in, given all the differences. That’s exactly what we tried to show you today – how and where we do it. Thank you very much for paying a visit. Vladimir Putin:Thank you for the invitation. I would like to wish you all the best of luck. Thank you very much. Goodbye.